Yes, He does. He needs our weakness! What an amazing and imbalanced swap! We give God our weaknesses and in exchange, He provides His unlimited power and strength. In Paul’s case, God did not remove the illness or disease (that ambiguous thorn in his side), but gave Paul endurance not only to bear it but to rejoice in it. I’ve been thinking about 3 things – ‘boasting in weakness’ as Paul puts it, God’s provisions and my needs. John Piper writes in his book Faith in Future Grace that most of God’s word to us is in the form of promises. 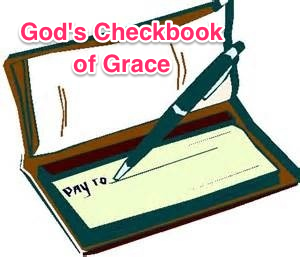 It’s like God hands his redeemed kids an unlimited checkbook called Grace. If grace is the set of all of God’s gifts to us, then within that purse or checking account or cupboard (whatever metaphor you prefer) are coins/checks/containers of different resources. The promises become precious to you and me only when we are desperate and bank our all on them, moving out of the paralysis of fear into the open space called ‘trusting God to do what He says’. Hence the checkbook. Some of us carry a checkbook around in a pocket or purse and when we need something and don’t have the money in hand, we write a check and count on both the merchant accepting it in lieu of cash and our bank honoring it. It’d be stupid to continue to be needy all the while carrying a valid checkbook! But that is how we act with God’s word. Okay – so here is where this gets real for me. What is my # 1 weakness? It’s the continual fear that I won’t have ENOUGH TIME to do what I need to do for school and home AND……have some time left over for me to do what Maria wants. Daily and hourly I face and fight that fear. So God, in His kind design to wean me off my fear and grow my default mechanism to trust Him continually, SEEMS to give me more stuff to do than I can SEE time available to me. I’m a slow learner. But I’m getting better. My thoughts are lining up more times than not (80%) with God’s word. My heart, however, still drags its feet. There are hundreds and hundreds of promises that will stun you if you will accept them as truthful words from a reliable source. All I have to do is look back over my past (recent and long ago) and see the many ways He has come through when I both relied on Him and doubted Him. (call that “mercy and kindness added to provision”). The definition of God is composed of His attributes. So when you consider just ONE characteristic – ‘faithfulness to His word’, if anyone could top God then that person would be God. The very definition of ‘God’ means that no thing or no one tops Him in ANY and ALL of these qualities. So we can reason and relax that when it comes to doing what He pronounces He will do, then He WILL do it! So tell me, which promise of God is most precious to you? What is your # 1 ‘go-to’ pronouncement of provision in this season of your life? I’m composing my own ABC list of promises that I can have at my disposal and I’d love to be reminded of other treasures in the Bible. I am addicted to the Gospel of Grace. I can’t get enough of this good news. But until last year, I had never heard of it. In January of 2011 our son Graham attended an Acts 29 Network Conference in Orlando and heard Tullian Tchividjian’s talk and story about Grace. Tullian who is a pastor and grandson of Billy Graham came to grace the hard way. First a prodigal and unrepentant Jonah (running away from God) and then a legalistic Christian, he eventually embraced the freedom of grace. Now he is committed to living on the basis of grace and teaching it wherever he goes. Mike and I caught a new lilt in Graham’s voice as he, too, shared a new vision of God. We quickly downloaded Tullian’s talk and have been reading and listening to Grace messages from him and others since then. So what is Grace according to the Bible? Grace is a gift you receive because the giver wants to give it to you. It is not based on anything you do to deserve it or earn it. It is very un-American what with our ‘pull yourself up by your bootstraps’ philosophy. Apparently Mephibosheth, like us, had a problem wrapping his mind around this ‘unnatural’ way of responding. But David has the crippled boy carried to his table and treats him as his own son, not for anything the useless young man could or ever would do. It was out of love for Jonathan that David treats him both tenderly and royally. We are Mephibosheth. We, too, are handicapped, having nothing to offer or exchange with God. Like the young Hebrew, we have to be carried in to the banquet hall, almost against our will, not having arranged this transfer. Our first thought is ‘what does he want with ME, in my state! (-Given my sin and unworthiness). What ‘Mephib’ and we have to keep reminding ourselves of is the radical thought that it is out of love of the King for someone else that we are so blessed. That is GREAT news. Because what we receive from God (forgiveness for our sins and Jesus’ perfect righteousness credited to our account) has nothing to do with what we do or don’t do. The daily gifts I receive and the future inheritance are all based on God the Father’s love for Jesus and what Jesus did for us! I don’t have to do anything!!!! And that is why it is called grace. The amazing corollary is that I can’t risk losing my position either, because again, it’s not based on ME. So what are we supposed to DO!!!! 2 Sam 24:10 But David’s heart smote him after he had numbered the people. David said to the Lord, I have sinned greatly in what I have done. Unlike his earlier major debacle with Bathsheba when Nathan confronted David with his sin, no human being needs to meet with David this time. The unseen Holy Spirit, who convicts all believers of sin, communicates directly to David’s heart. The king has called for a census during a time when his kingdom is not at war, and no conscription is necessary. Joab, his military chief of staff, has strongly advised against it. But the King’s wishes prevail. However, after 9 months of counting when David is presented with the data, he immediately comes face to face with the fact of his sin. He confesses immediately to the Lord and submits to his punishment. We know that he was correct in his spiritual inventory, because the prophet Gad is directed by God to present to David three choices of punishment. God implements the 3-day plague that David has chosen as the lesser evil. A further sign of spiritual growth is when David, appalled at the price his own people have to pay for his sin, attempts to halt the plague’s destruction at the end of the allotted time. His prophet Gad instructs him to set up an altar and sacrifice. The intended place is Araunah’s barn. When the farmer finds out David’s intentions, he offers to supply everything David needs at no cost, including the land, animals and firewood. David, totally unconscious of any embarrassment, publically renounces the gift by explaining that he will not offer to the Lord something that has not cost him. David has learned that true worship, where one declares the worth of another, requires giving up of something of personal value. I’m struck by a parallel thought. First, the mighty King David, the man after God’s own heart, is still sinning. I need to prepare myself for the fact that as I mature, I will, from time to time, still settle for less than God’s glory in my choices. I am still a sinner, though redeemed. But I can always repent and receive forgiveness as long as I am humble. Second, my sin will cost others, and my repentance will cost me. But I rather face reality and prepare for it, then live with the illusion that Christian growth leads to an end to sinning. Not in this life! 1 Sam 30: 1-6 Now when David and his men came to Ziklag on the third day, the Amalekites had made a raid against the Negeb and against Ziklag. They had overcome Ziklag and burned it with fire and taken captive the women and all who were in it, both small and great. They killed no one, but carried them off and went their way. And when David and his men came to the city, they found it burned with fire, and their wives and sons and daughters taken captive. Then David and the people who were with him raised their voices and wept until they had no more strength to weep. David’s two wives also had been taken captive, Ahinoam of Jezreel and Abigail the widow of Nabal of Carmel. And David was greatly distressed, for the people spoke of stoning him, because all the people were bitter in soul, each for his sons and daughters. But David strengthened himself in the LORD his God. David’s men had every right to be upset over the kidnapping of their families. The Amalekites were not present to absorb this outrage, so it was directed at their own beloved leader, David. Had they stopped to think rationally, they would have concluded that clearly David was not responsible for this disaster. After all, he suffered the same loss as his men. What stuns me is how David did not argue with them or show any fear or start to make plans. He immediately turned to the Lord for his strength. What did that look like? He must have privately poured out his grief over the loss of his wives and sought God’s counsel about how to deal with his men. Did this last 30 seconds or 2 hours? Was there much time before his men actually picked up stones? We don’t know. But his next step was to consult with the priest and pray publicly to the Lord for a plan. God answered and David moved into leader-mode and constructed a rescue plan that eventually succeeded. All family members were saved. David’s priorities in the face of a leadership and life crisis were vindicated. And David lived in the stronghold and called it the city of David. And David built the city all around from the Millo inward. And David became greater and greater, for the LORD, the God of hosts, was with him. And Hiram king of Tyre sent messengers to David, and cedar trees, also carpenters and masons who built David a house. And David knew that the LORD had established him king over Israel, and that he had exalted his kingdom for the sake of his people Israel. In this passage, David had been anointed King over both Judah and Israel and was enjoying great success. Scripture tells us the reason was due to God being with him. But what was David’s assessment? Was his stature and international renown due to his own prowess? How encouraging it is to follow David’s thought process when foreigners bestow him with gifts. A lesser man could easily conclude that this good fortune was due to his own greatness. But David lived with the sovereign intervention of God in his life. Had his life unfolded as his mom and dad expected, he’d still be a shepherd and last in line to inherit anything. David clearly understood that it was God who had cast him in this leading role and that God was the director and had his own purposes for Israel. One can read elsewhere how David did not always act righteously, but here, at least, are two examples that offer us patterns to emulate. In the face of immediate disaster, David turned to God. In the face of impressive success, David acknowledged God’s agenda and doing. He was neither too worried about his circumstances, nor too impressed with his own curriculum vitae. His eyes were on God in either case. May it be so with us.